This issue focuses on two key themes in research on terrorism and violent extremism: non-Islamist religious-political terrorism and strategies for preventing violent extremism (PVE). First, the issue observes Aum Shinrikyo in Japan and Bodu Bala Sena (BBS) in Sri Lanka, both Buddhist groups that have drawn on extremist misinterpretations of the religion. While Aum Shinrikyo and BBS challenged the state’s political ideology, BBS has engaged in attacks against minorities and disseminated violent and extremist propaganda. 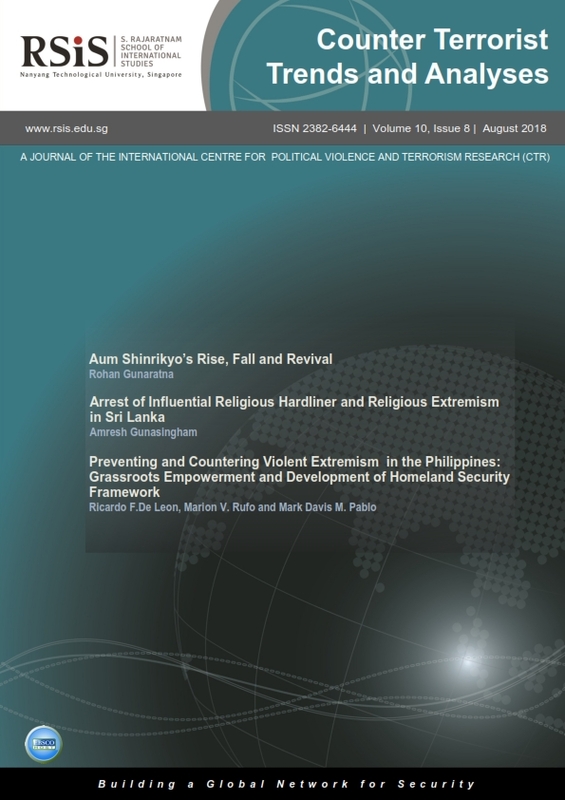 This issue showcases the diversity of terrorist groups in terms of ideological and religious influences, rooted in the domestic context, that could also motivate hate speech and attacks against Muslims (a religious minority in the case of Sri Lanka). Second, the issue focuses on PVE strategies in Southeast Asia, with the Philippines as the key case study. The article discusses the importance of moving beyond countering violent extremism (CVE) to PVE as long-term efforts to prevent terrorist groups from recruiting and gaining traction. To this end, it is proposed that communal harmony and peacebuilding measures incorporating the local communities should lie at the core of all PVE strategies. Rohan Gunaratna’s contribution looks at the Japanese terrorist group, Aum Shinrikyo, which perpetrated the 1995 Tokyo Subway Sarin attack. The article analyses the group’s ideology and looks at its revival through various splinter organisations, specifically Aleph, which is focusing on recruitment through social media. It also looks at the historical development of Aum Shinrikyo, in particular, the leadership of Shoko Asahara (ideological and personal ambitions), international networks (Russia, United States and Australia) and attempts to acquire Chemical, Biological, Radiological and Nuclear (CBRN) technologies. Amresh Gunasingham focuses on religious extremism in Sri Lanka against the backdrop of Galagoda Aththe Gnanasara, a hardline cleric’s arrest in June 2018. The article discusses the role of Buddhist extremist Bodu Bala Sena (BBS) group that has exploited ethnic and religious divisions, often targeting the minority Muslim community. Despite the rise of right-wing Buddhist extremists, the peaceful majority has staged demonstrations against targeting the Muslims. The article also notes the inability of authorities to take action against members of the right-wing Buddhist clergy that has incited ethno-religious violence and highlights a need for long-term policies to counter religious extremism. Ricardo F. De Leon, Marlon V. Rufo and Mark Davis M. Pablo discuss the twin threats of the terrorist group Islamic State (IS) and the insurgent group New People’s Army (NPA) to the Philippines, while proposing a need for robust grassroots initiatives that incorporate the barangays (local villages). The piece highlights a need for holistic PVE approaches while discussing the work of the Integrated Community Action against Radicalisation and Extremism (i CARE) & Whole-of-Community Approach (WOCA) in the aftermath of IS’ attempted takeover of Marawi. It highlights the idea that empowering the barangays as the bulwark against violent extremism, will make the local communities more resilient against terrorist groups. Lastly, it proposes that a stronger homeland security infrastructure with the barangays as the first line of defense will strengthen preemptive responses to violent extremism by the IS and NPA.